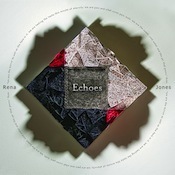 A sweet serving of warm, comfortable chillout is on the menu for Rena Jones’ new release, Echoes. According to her press releases, this disc represents something of a departure for Jones in that she brings in full ensembles on each track to create a live studio album. The result is a sound that’s deep and rich, full of the resonant pleasure of violin and cello, and just a pure joy to kick back with. The cool begins right off the bat with the title track as Jones trades violin licks with Emancipator’s Ilya Goldberg. A slow beat snaps out a smooth cadence as the bows sigh and pizzicato notes dance in the background. The quality of the sound here also immediately jumps into the foreground. Jones is a sound designer and producer, and the mix here is impeccable–clean, loaded with dimension, and with everything balanced beautifully. It’s like listening in 3D. As such, deep listens reap good rewards. Let yourself fall fully into “Returning to the Source” and hear all the small sounds coasting around like dust in sunlight and every bit as mesmerizing. There’s a whole lot of tasty ear candy happening here, moments that either give you goosebumps because they’re so good or that just stretch your face into an involuntary smile. Sopie Barker, whose voice has graced music from Zero 7 and Groove Armada, lays out breathy, airy lyrics on “Wishes” and “Mirror Me.” There’s a hint of Bebel Gilberto smokiness in her voice, and her belted high notes are both angelic and powerful. The mix of synth from Matt Robertson, who’s played with Bjork and Bat for Lashes, and Roel Funcken’s trippy string-sound manipulations on “Mesmerized” warble and wobble their way into your head while drummer Earl Harvin keeps a cool, jazzy beat. Rubin Elias’ Rhodes piano on “Shadows” reminds me of how much I loved Chick Corea in his electric days. Echoes is a downtempo masterpiece, a cocktail-hour-ready blend of sweet grooves and laid-back attitude. Perfectly produced and loaded with crossover potential, Echoes is a disc I expect will end up on plenty of Best Of lists at the end of the year. It’s in heavy rotation at Hypnagogue HQ and will stay there. Melt into this. Available from Rena Jones’ web site.